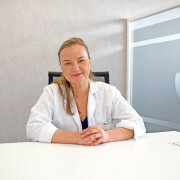 After graduating in medicine in Poland in 2002, Dr. Natalia Szlarb worked in gynaecology and obstetrics at various hospitals in Germany. During her studies she undertook international internships in Brazil, Egypt and Poland. In 2011 she obtained her PhD in Immunology in the United States. She has been part of the IVF-Spain medical team since early 2013. Dr. Szlarb understands that each patient is unique and, therefore, devotes time to explaining and assessing the different options available in any given situation. Dr. Szlarb speaks fluent English, German, Polish and Russian.